The chefs and restaurateurs in Jerusalem have been developing a modern Jerusalem kitchen; one that isn’t preoccupied with what’s in fashion and chasing down the latest trends – although they sometimes end up setting them. Instead, the food here is influenced by the wide range of ethnicities, religions and cultures that make up the city. What follows is a list of the ten best restaurants the city currently has to offer, plus a bonus 11th eatery. 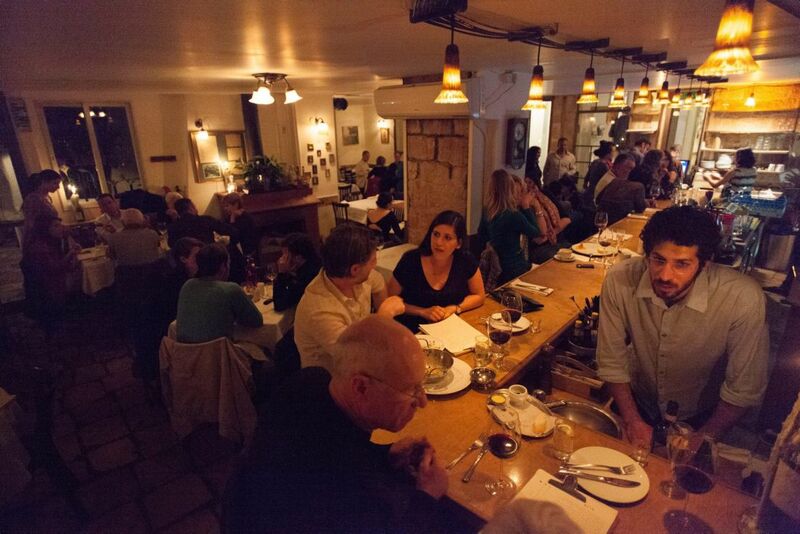 This restaurant was opened in 2000 by chefs Ilan Grossi, Eran Peretz and Roger Moore, who many consider the founding fathers of the Jerusalem culinary scene. 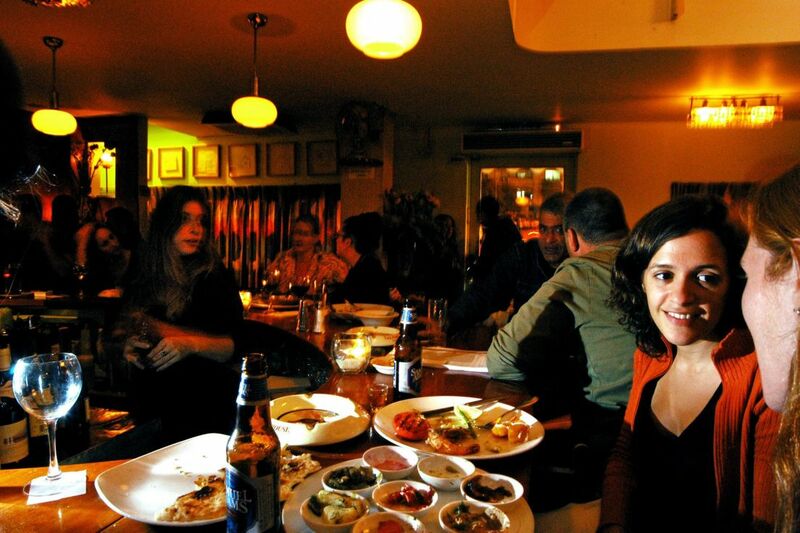 Although it was opened at a particularly troubled time (the Second Intifada) and has gone through hardships along the way (among them a relocation and the departure of Ilan Grossi), Chakra has remained one of the leading restaurants in the capital, and one of the most loved dinner places there. Through dishes like beetroot tortellini in Parmesan butter, kebabs with tahini and fire-roasted vegetables, or gnocchi with lamb and beef-butter sauce, the kitchen reaches over the walls of Jerusalem into the Mediterranean Sea all the way to classic Italy. The outcome is a new culinary genre that speaks with a Jerusalem accent. Click here for Chakra’s English menu. Adom, which has been around for 15 years, is one of the most veteran restaurants on this list (together with Chakra). In fact, many chefs have trained there and big names in the Israeli restaurant scene have emerged from there – like, for example, Michael Katz and Assaf Granit (whose Machneyuda restaurant we’ll get to next). Adom, which was originally a wine bar – the first in the capital – is today something between an easygoing family bistro and an elegant French wine bar, and that comes out in its food, its lighting and of course its wine. On the menu you’ll find dishes like sabih with amba aioli and poached egg, artichoke ravioli with goat’s cheese, and chestnut gnocchi, as well as desserts like classic crème brlée or tahini ice cream, and, of course, loads of wine. Click here for Adom’s English menu. Here’s a restaurant that could almost be taken for granted; one that any such list would be incomplete without. 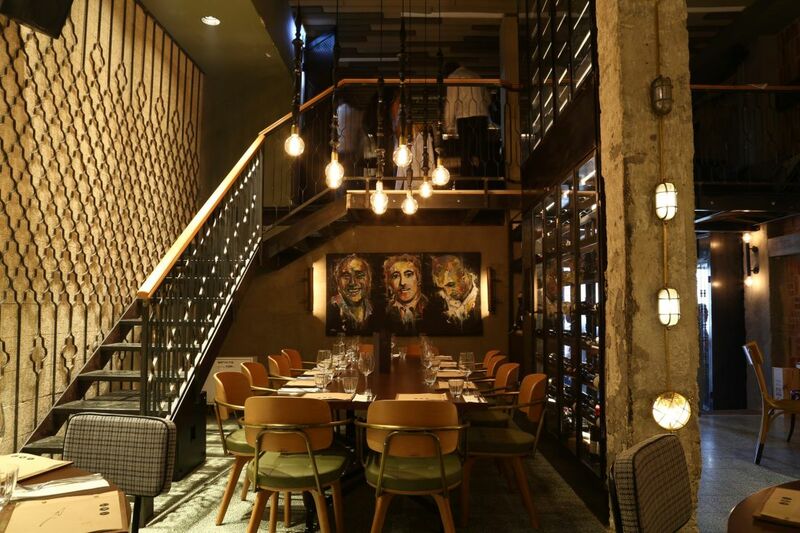 Machneyuda was opened next to the Mahane Yehuda Market seven years ago by three chefs: Assaf Granit, Yossi Elad and Uri Navon. It set a high standard from the outset that managed to prompt many a Tel Aviv foodie to hop in their car and drive to Jerusalem just to try it out. 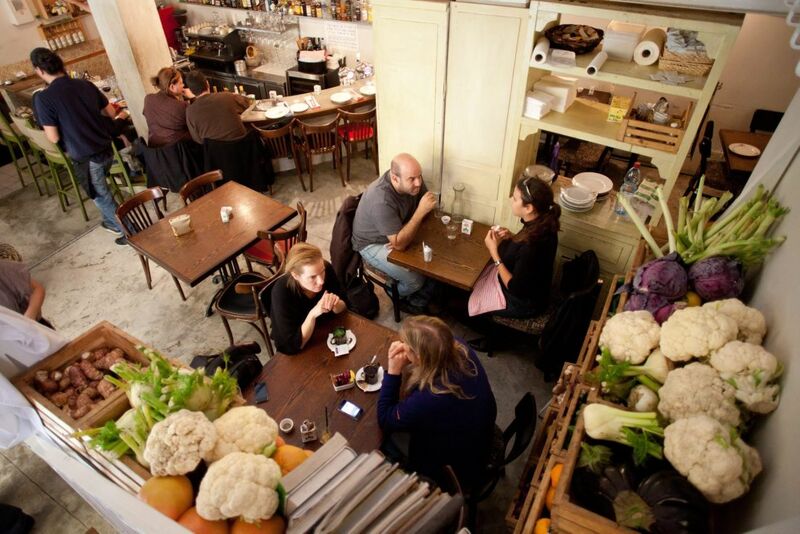 Since then, in only seven years, the restaurant has turned into a group with five places in Jerusalem, two in London and even a catering company. There’s a common Jerusalemite thread in all their restaurants and, particularly in Machneyuda, with its bustling and lively atmosphere and food inspired by the market, from kebab with tahini-gurt, pesto, harissa and pickled lemon to “Uri’s Mum’s Basbousa” cake with tahini ice-cream, whipped cream, fruit and date honey. And then, of course, one unforgettable polenta. For Machneyuda’s English menu, click here. Mona started out as a member of the Machneyuda group, but its character and kitchen always maintained a line of French elegance more than the market feel that characterizes the group’s other restaurants. Two years ago, Mona broke off from the group and embarked on an independent path under the ownership of chef Moshiko Gamlieli (who ran it from the outset). Since then, the restaurant – with small changes but no revolutions, thank God – has been one of the most stable and loved by patrons who enjoy fine dining, with white tablecloths, punctilious service, and most of all exceptional food. On the menu you’ll find classic meals with a wink, form polenta with mushroom ragout; to leek risotto; spinach gnocchi with sage butter; Jerusalem artichoke agnolotti; hanger steak with potato gnocchi; chicken liver with shallot onions; and, not to be forgotten, baked cheesecake with goat’s yogurt, sour cream and Szechuan sherbet; or chestnut and mascarpone tart with vanilla anglaise and cinnamon ice-cream. Basically, when classic Europe meets the Middle East. For Mona’s English menu, click here. Anna is an Italian and slightly Israeli restaurant that was established not long ago in the stone structure of the Ticho House museum. Serving only kosher dairy dishes, chef Moshiko Gamlieli has created a promising restaurant whose ingenuity lies in its simplicity. Its magic is first and foremost in the ingredients: the freshest raw materials, skilfully used and properly prepared. One of the dishes that exemplifies this perfect combination of simplicity and precision is the spaghetti with pecorino cheese and black pepper. Others include the fish fillet pappardelle, Anna gnocchi, Napolitano pizza, and, for dessert, the buttery lemon tart or rich tiramisu. If the food here wasn’t convincing enough, we’ll also have you know that the place is not just a restaurant but also a social project; it supports at-risk youth by training them up in the kitchen. 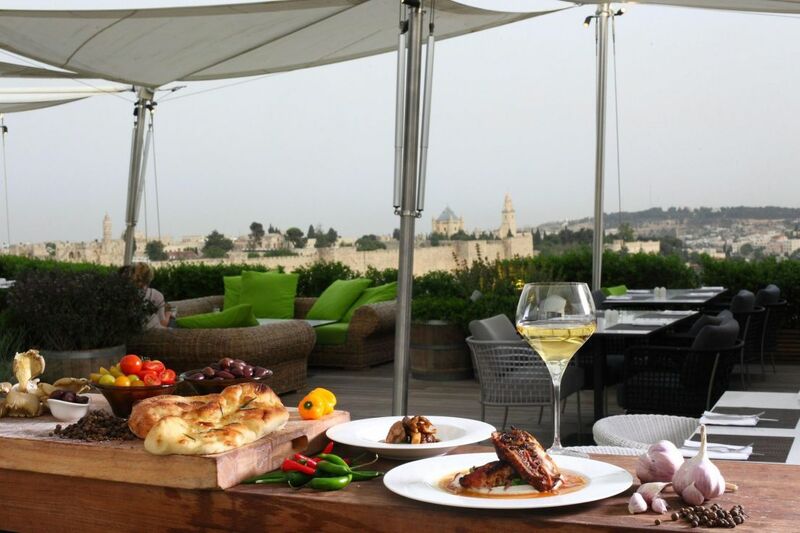 Atop the prestigious Mamilla hotel you’ll find Rooftop, a brasserie that takes the best of the local kitchen up a notch – all before a breathtaking view of the Old City of Jerusalem. Chef Kobi Bachar (of Mul Yam fame) runs the kitchen. Among the Mediterranean dishes that he took up a notch are duck in handmade pita with cucumber salad and coriander; and cod shawarma with spicy tomato salad and black smoked tahini. These are particularly great together with a cocktail at sunset. For Rooftop’s Hebrew website, click here. 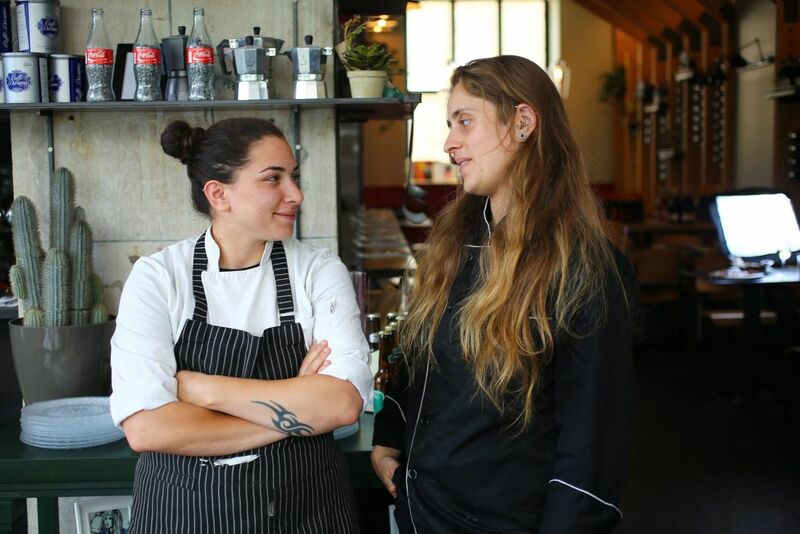 Rinat and Alice Moyal are two young chefs who are partners in life and decided to open, against all odds, this non-kosher restaurant in the capital. This restaurant tells a story of complexities and cautious optimism. Rinat and Alice met working at Adom and have been together (almost) ever since. 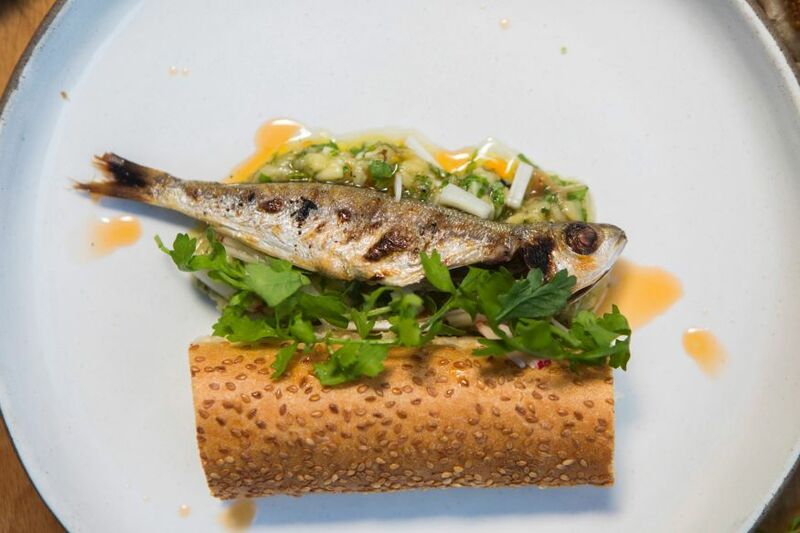 Some of the dishes in their restaurant are planned and put together out of playful trials, while others come from recipes they collected and adapted along the way. This is expressed in meals like salmon with a secret crust and a personal story, or in dishes like lima bean hummus and Camembert cheese with bold chutney; or even the apparently simple small eggplant focaccia baked in the in-house taboon. Don’t forget to leave room for the lemon cheesecake with anglaise and basil. For Satya’s Facebook page, click here. Nestled in the Mahane Yehuda Market, Trattoria Haba was opened over two years ago by the Haba family, a family of veteran bakers in the city. Here you’ll find a variety of freshly baked pastries, breads and desserts, as well as dairy dishes (although the bread that’s served with them will steal the show). 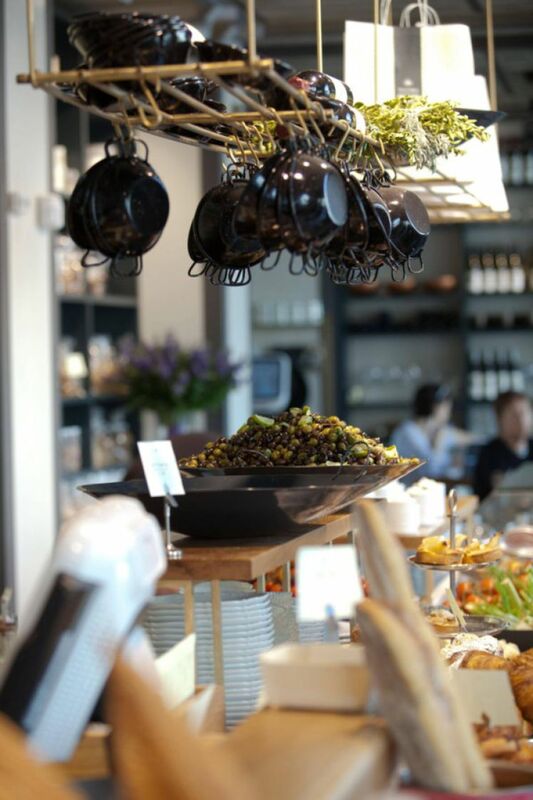 Among the treats on offer are rich breakfasts; cheeses and fruit; croque-madame made of challah bread, gouda cheese, poached egg, homemade pickled salmon and green salad; shuk-shuka, which is their version of spicy shakshuka with salad and tahini; and more. Other than breakfasts, you’ll find taboon-baked pizza and calzone; pastas; lasagnes; quiches; fish and salads (their version of a Nicoise salad was surprisingly good). This is a good place to keep kosher while breaking your diet. For Trattoria Haba’s Facebook page, click here. Until last year this restaurant operated out of a small space by the Mahane Yehuda Market, but the space was too small to contain the masses of Jerusalemites who heard of Chef Zakai Huja’s magic hands, and waited in line for a table. This summer, the restaurant moved to a larger building and now has three separate spaces: a bar, gallery and a large dining area, all touched with a Jerusalem design that connects old and new. 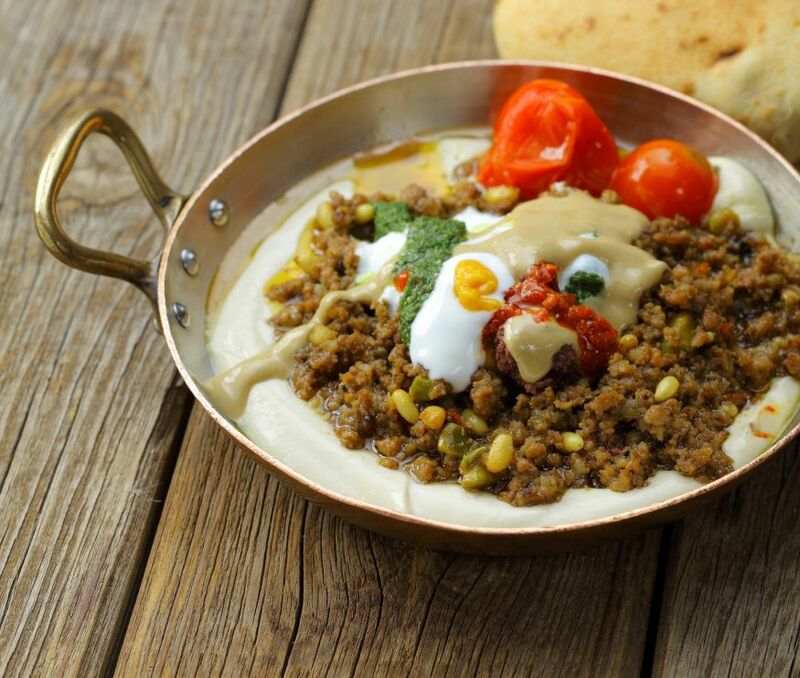 This connection of old and new extends into the food, as Huja – third generation in the market – creates modern interpretations of classic Jerusalem dishes, incorporating ingredients known and loved by those who grew up in the city (Jerusalem bagel, semolina cake, kibbeh and others). 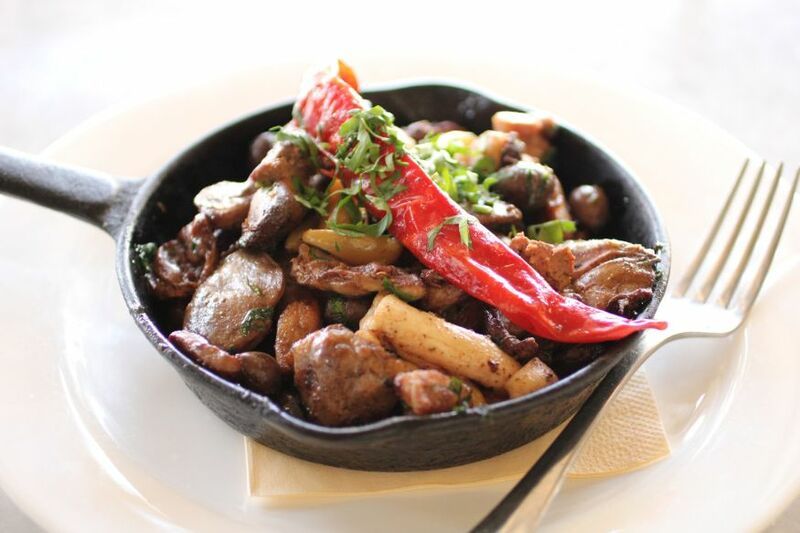 Dishes include Kurdish ravioli; asado off the bone on Jerusalem bagel; goose liver with semolina cake; tuna fricassee; veal sweetbread with pasta and more. Huja proves that it’s possible to create a kosher kitchen that is both high quality and accessible. It’s no wonder the Jerusalemites are still waiting in line. Let’s start with the bottom line: Istabach is an eatery that embodies everything that’s beautiful about the common, everyday Jerusalem. How? Via the place’s specialty dish: a Syrian-Kurdish pastry called shamburak, which is dough stuffed with meat. There are various meats to choose from – among them rib stew, tongue, asado and brain – and sides like chutney, curry and cured vegetables. This wonderful combination of flavors is another shining example of the modern Israeli kitchen, and along the way, Oren Sasson-Levi – the man behind Ishtabach – proves that the line between simplicity and complexity is very fine. For Ishtabach’s Facebook page, click here.